What is PetArmor - Generic To Frontline Top Spot? As seen on TV, PetArmor® is a flea and tick preventative that works just like Frontline® Top Spot®. It contains the same active ingredient, fipronil, as Frontline® Top Spot® and protects pets for 30 days against pesky fleas and ticks. PetArmor® comes in an easy-to-use, squeeze on applicator and is waterproof after 24 hours of application. Not only does PetArmor® kill fleas and ticks, but it also kills chewing lice and controls mites that may cause sarcoptic mange. Just like Frontline® Top Spot®, PetArmor® is specifically formulated to kill fleas and ticks per your pet's weight. So picking the right package is important in getting complete protection for your pet. The main ingredient fipronil, also found in Frontline® Top Spot®, is a broad-spectrum insecticide that disrupts the central nervous system of fleas and ticks. Once PetArmor® is applied, the fipronil spreads by a process called translocation. It is gradually spread by your pet's natural oils, accumulating in the oil glands and absorbed into the hair and skin. It then kills adult fleas and ticks within 24 hours. PetArmor® works best when your pet's skin is in optimal condition. For external use only. Do not use PetArmor® on Rabbits or other animals. Use only one pipette per application and do not reapply sooner than 4 weeks. Keep out of reach of children. What is the most important thing I should know about PetArmor®? PetArmor® provides convenient and effective flea and tick control for dogs and cats, puppies and kittens (over 8 weeks of age). It controls and prevents infestations of adult fleas prior to egg-laying, including fleas that could cause flea allergy dermatitis. It is effective against all stages of the brown dog tick, the American dog tick, lone star tick and deer ticks (the major carrier of Lyme disease). In addition, it eliminates infestations with chewing lice and aids in the control of sarcoptic mange infestations. How should PetArmor® be applied? Use PetArmor®, on dogs and puppies 8 weeks of age or older. 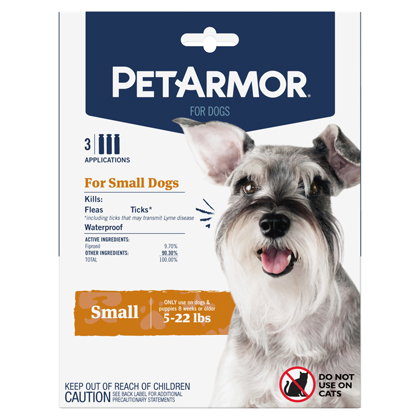 PetArmor® for dogs is available as 0.67 ml applicators for dogs and puppies 5 to 22 lbs, 1.34 ml applicators for dogs 23-44 lbs, 2.68 ml applicators for dogs 45-88 lbs and 4.02 ml applicators for dogs 89-132 lbs. Wait 24 hours for product to dry before swimming or bathing. Do not reapply for 30 days. Use PetArmor® for Cats, on cats and kittens 8 weeks of age or older, which is available as 0.5 ml applicators. Do not reapply for 30 days. 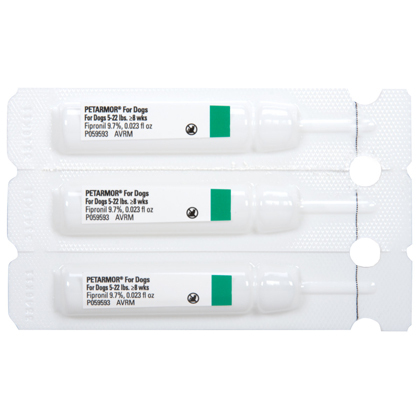 To use PetArmor®, place the applicator tip through your pet's hair at the skin level between the shoulder blades. Apply the entire contents of the applicator in a single spot to your pet's skin. Use only one applicator per treatment. What are the potential side effects of PetArmor®? What should I avoid while applying PetArmor®? This product is for external use on dogs and puppies and cats and kittens 8 weeks or older. PetArmor® is approved for use on breeding, pregnant, or nursing animals. Consult a veterinarian before using on medicated animals, animals using this product with other pesticides, and debilitated, or aged animals. This product is flammable. Keep away from heat and open flame. This product is harmful to humans if swallowed. Call a physician or poison control center. Drink 1 or 2 glasses of water and induce vomiting unless patient is unconscious. This product can cause eye injury. Flush eyes with plenty of water for 15-20 minutes. Call a physician if irritation persists. Avoid contact with skin, eyes or clothing. Wash thoroughly with soap and water after handling. What happens if I overdose my pet on PetArmor®? After opening the box, detach one of the sealed packages from the other two by pulling it apart on the perforation. Then, cut along the dotted line at the top of the package and peel back the foil, exposing the pipette. Snap the tip of the pipette and part your pet's hair with your index finger and thumb between the shoulder blades exposing his or her skin. Lastly, invert the tube and squeeze firmly to apply all the contents to the exposed skin. Wait until the application site is fully dry (usually 24 hours) before bathing your cat or dog or letting your dog go swimming.